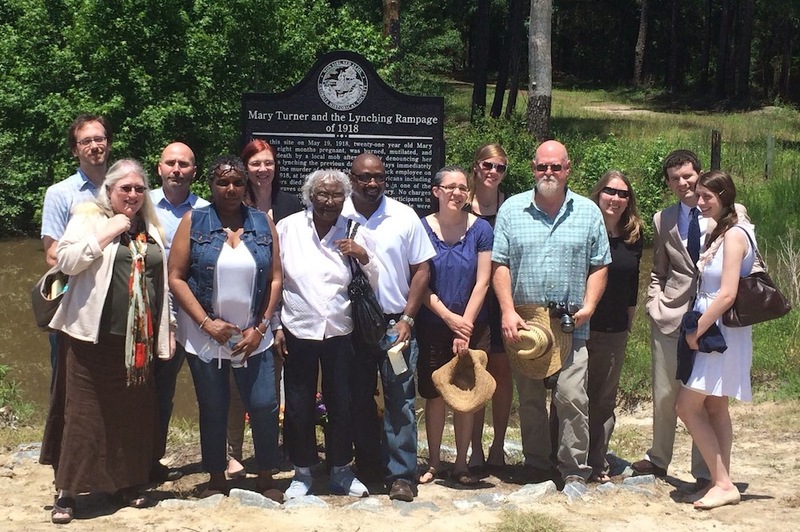 Members of the Mary Turner Project in 2014 in front of the marker. Photo courtesy of John W. Rogers. It is a place that has been dear to my family for generations. This was the river where my grandmother, the wife of a “white trash” sharecropper, fished for most of her 80 years. It is the place I learned to savor nature. I have swum, camped, fished, and canoed there for much of my life. It is also the site of one of the most horrible lynchings in U.S. history, which took the life of a young, black, pregnant Mary Turner in May 1918. Mary Turner was killed by local whites because she publicly objected to the lynching of her husband Hayes, which had occurred just days before. Their deaths were part of a weeklong “lynching rampage” (in historian Christopher Meyers’s words) that killed seven other black people whose names are known, as well as at least three others who have not been identified. In 2007 I was shaken when I stumbled across Meyers’ account of these events while doing research in the Lowndes County Historical Society. That article painfully showed me that I was unknowingly walking on blood-soaked earth, and it changed forever how I thought about the river. Soon after Mary Turner’s death, NAACP investigator Walter White reported that Turner was captured and taken to the Little River where she was first hung upside down, doused with gasoline, and then set afire. Once her clothes had been burned off of her, one individual approached her and cut her pregnant belly open, spilling her unborn child to the ground. The group of white people then shot bullets into her eviscerated and scorched body. Her remains were later buried near the lynching tree and a “whiskey bottle with a cigar stump in the neck” was used to mark her impromptu grave. At the time of these heinous crimes, my grandmother was 18 and my grandfather was in his early twenties. I now often wonder what they thought about these crimes and why they were never mentioned in my family. Angered that this event remained unacknowledged, I assigned Myers’ article as a reading in a course I was teaching called “Racial and Ethnic Relations,” at Valdosta State University, less than 20 miles from the spot where the lynching took place. I wanted this “disappeared” person and the other victims of May 1918 to be resurrected from history instead of erased by it. To my surprise, the article not only stunned my students, but several of them demanded that we do something to make these crimes known. Within two weeks, the Mary Turner Project was born. The Project is an all-volunteer, multi-racial, multi-generational collective of students, faculty, and local community members that is now 11 years old. The Project has carried out too many actions to list here, but it has provided me and other members with some moments that shifted our understanding of this nation’s history, our community, and each other. 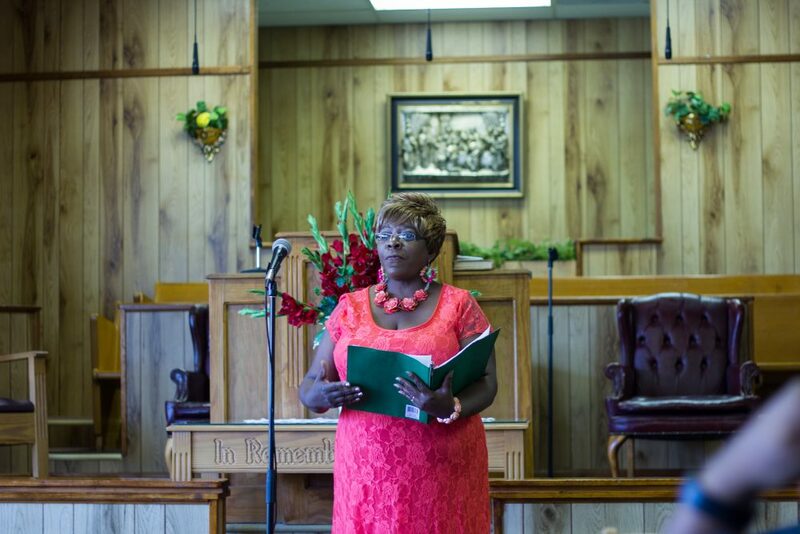 Audrey Grant, great granddaughter of Mary Turner, speaks at the gathering in 2014. Photo courtesy of John W. Rogers. Shortly after the Project’s start, descendants of Turner and the other victims of 1918 began attending our meetings and supporting the organization. Their presence humanized this local history for everyone involved. The Project was able to provide family members with Meyers’ primary research—including a mound of assorted newspaper articles, telegrams, and the NAACP’s investigation. We also carried out further research helping families “fill in the details” that they didn’t have about the events of 1918. To this day, the Project is regularly contacted by descendants of victims of Georgia lynchings and asked to do research. We have done our best to fulfill these requests. Though justice has not been served, family members have learned more about their ancestors and learned that there are others in the world who care about these events, their ancestors, and justice. During its first two years, the Project fundraised and petitioned the Georgia Historical Society to erect a physical marker describing the events of 1918 near the site of Turner’s murder. We wanted the state of Georgia to officially acknowledge these crimes—if only in a symbolic way. After two years of work and struggle with the Georgia Historical Society, in 2010 we secured and installed that state-sanctioned Historical Marker. Before the public dedication ceremony, I met my dear friend John Rogers, a middle-aged white Southern man like myself, and Nate Wright and Robert Jenkins, both black men from the South in their forties, to install the marker in a location just east of Hahira, Georgia. It took us two to three hours to mix and pour 1,200 pounds of concrete by hand with five-gallon buckets. We used the water of the Little River to make the concrete and secure the marker. The Project has provided me and other members with some moments that shifted our understanding of this nation’s history, our community, and each other. On that muggy May afternoon in the middle of nowhere, the four of us paused and talked about what it meant for us to come together at this place of tragedy and racist brutality to install what is essentially the tombstone for a person so horribly killed and dehumanized, given the community and times we all grew up in. As four men who grew up in the largely still-segregated South, the idea that any of us might be doing this someday would have been inconceivable to us as children, but there we were. I will never forget that day, that conversation, or those men. A final “sacred moment” I hold close involves the Project’s 2014 commemoration ceremony for the victims of 1918. For several years the organization had held half-day gatherings at which multi-racial, multi-generational groups of 100 to 150 came together to remember the events of 1918, sharing a meal, singing, reflecting, and praying together. Every year we would also motorcade as a group out to the marker site for a short ceremony. Led by a local deputy, that motorcade so resembled a typical Southern funeral procession that oncoming traffic always pulled over and stopped out of respect for the dead—a long-standing tradition in the South. In 2014 the descendants of Mary and Hayes Turner planned their annual family reunion to coincide with the ceremony at the marker. Photo courtesy of John W. Rogers. 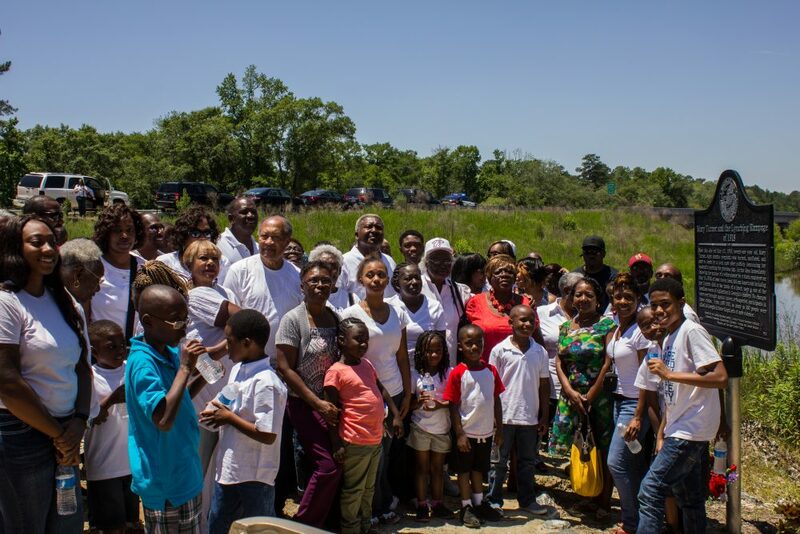 Although each year was powerful in its own way, in 2014 the descendants of Hayes Turner planned their annual family reunion to coincide with the event. Dozens of Mary and Hayes Turner’s relatives paid homage and reflected on how far their families had come. It was humbling and felt historic to witness them model how to face something so horrific and painful with grace, and love. I have been part of very few such spaces in my life that felt more human. The Mary Turner Project has not ended racism, nor has it addressed ongoing forms of institutional and individual racism that plague the place I call home. But it does serve as a small example of what is possible when we confront our shared, collective histories instead of denying that they exist. For example, part of the Project’s work has centered on identifying streets and buildings in our community that are named for slave owners and Confederate leaders who wanted to preserve and expand the enslavement of black people. I have also learned that we should work for justice, in all its forms, not simply because of the harm and destruction that injustice does to others in our human family, but also because we ourselves are humanized by the process. So this May, we will once again gather at the river that my Grandma so loved, to remember the horrendous events of 1918, where we have been as a community and nation, and where we still need to go. And when we do, I and others will once again step into and cherish a sacred moment of sheer humanity. Mark Patrick George is an Applied Sociologist whose teaching, research, and community work centers on racial and ethnic relations in the United States. He is also a founding member and the coordinator of the Mary Turner Project.